Hello people of the internet!!! On today’s `YouTube Wednesday` we’re going to talk about an AMAZING book series that y’all should all be reading. If you`ve never heard of the `TNT Force Cheer` then what are you waiting for? Seriously you’re missing one of the best YA series ever! Today I will review book 2 in the series, `Reaching The Summit` (and I was also fortunate enough to interview the series` author Dana Burkey and speak to her about very serious topics such as her inspirations, her cheerleading background, and of course ships, because the ships must sail. so please check out the interview at the end of this review). If you haven`t read the first book in the series `Learning To Fly’ then continue at your risk because there will be mild spoilers (btw you can check out my review of `Learning To Fly’ here:http://bit.ly/29AfDXA. So now let`s get to the review! Ready? Ok, let`s go!!! When we last left everyone’s favorite tough as nails, tomboy protagonist Max, she had just entered the world of competitive cheerleading. Max discovered that, despite her previous assumptions, she really enjoyed cheerleading, and that she has an amazing natural talent for it. 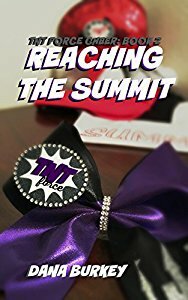 `Reaching The Summit` begins in the middle of the cheer season where we find Max less than excited about her team`s performance thus far. As the story continues, Max has to deal with preparing for a HUGE cheer meet called The Summit. Along with this stress, Max begins to notice that 2 of her best guy friends, Peter & Kyle have been acting strange around her (wonder what’s up with that right!?!). As Max attempts to deal with all of these changes in her life, she also finds herself at a crossroads when she decides that she wants to try out for the local softball league (a sport that she’s also AMAZING at…seriously what can this girl NOT DO!). Now Max has to learn how to integrate her new “girly” cheer life with her “tomboy” nature, as well as discover what world her heart really belongs to. After reading this book I was once again left with all the feels. It still amazes me that Dana is able to not only make Max a fun, likable protagonist that you can`t help but cheer for (not pun intended), but is also able to surround her with a cast of characters that you can’t help but fall in love with as well. Definitely a 5 smiley face read (because as you know, smiling faces are SOOOO much better than stars). Make sure you check out my interview with Dana below & while you’re there subscribe to her channel because she’s awesome and we all need more awesome people in our lives! celindareyesblog November 13, 2016 No Comments on YouTube Wednesday: Reaching The Summit…the next epic chapter in the TNT Force Cheer book series. Category: Interviews, YouTube Wednesday.